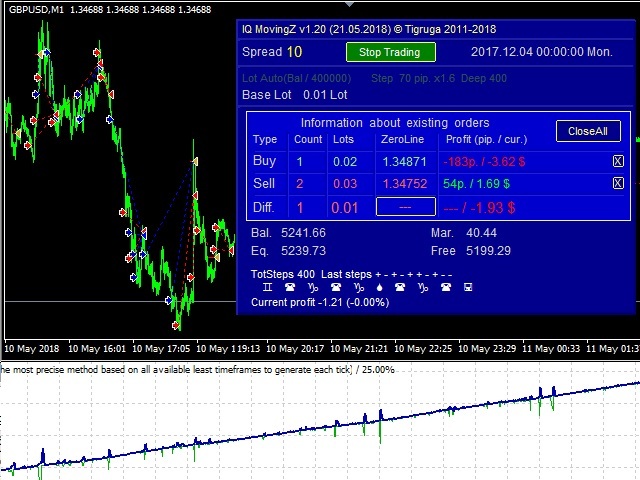 This is an automatic 24-hour trading system based on the algorithm of collective behavior of adaptive automata (a kind of algorithms of self-learning of artificial intelligence) that does not require manual intervention and does not use any indicators or well-known trading methods. The principle of the EA is to remember and analyze each step. A step is a price movement for a certain number (BaseStep) of points up or down. The depth of memory (how many steps to remember and analyze) is determined by the variable Deep. When the step storage stack is full, the oldest step is forgotten when a new step arrives. Thus, new (more current) information is constantly replacing outdated. Constant updating of information about the price behavior allows making forecasts more linked to the current situation in the market. Having memorized a sufficient number of steps, the EA makes a forecast for the current movement. If the forecast probability of moving up is two times more than the probability of moving down, a signal is issued to open a BUY order. If the probability of moving down is 2 times more than up – the signal to open a SELL order. Having received a signal to open an order, the EA checks two mandatory conditions: 1) the size of the spread in the allowed range; 2) the absence of the nearby (top or bottom closer than a BaseStep) order of this type. If the conditions are met, the order size is calculated and the order is opened. If the order is opened first in its type, its size is defined as LotDefault. If it is the second or more – LotDefault Size is multiplied by the rate increase factor to the degree equal to the number of orders of this type (LotMultN, where N is the number of orders of this type). Orders are closed either by trailing or by reaching the minimum profit in the iteration (iProfit). Program Language – language of the messages (Russian/English). Delay – delay time (in milliseconds) after any operation with orders. Magic – unique identifier for all orders processed by the EA. If Magic=0, the EA will process all orders it detects on the current instrument. First Lot size – size of the first lot. This value will be initially considered as the default lot (LotDefault). Lot type – first lot type. It can be automatic (auto) or constant (const). iProfit - amount of profit per iteration. Specified as a percentage of the deposit. Base Step – step size in points. Lot multiplier – multiplication factor of the lot size depending on the number of orders of this type. Deep of memory - depth of the EA memory. This parameter determines how many steps the EA will remember and analyze. Max Spread – maximum spread size (in points), at which an order can be opened. The parameters were set up for a deposit of $4000 with a leverage of 1:100, on an ECN account. All pairs are six figures. 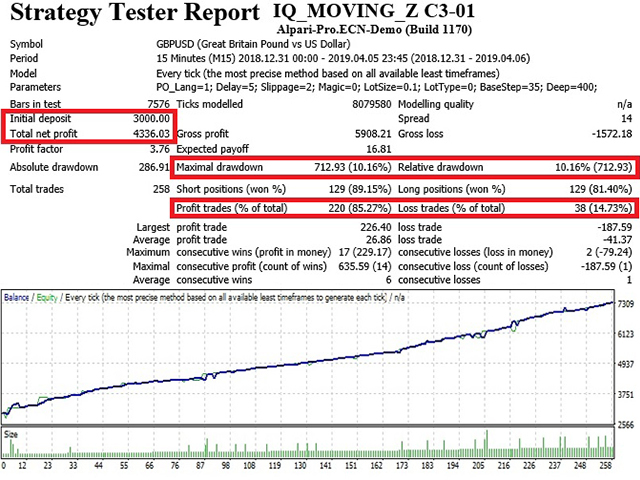 Demonstration of the EA in real time with these parameters (free demo trade signal) is available here. The EA sets initial price of $497.00 is only valid for the first 10 buyers. Later the price will rise. Detailed user manual in English can be downloaded in the Comments tab. Video about the work of the EA (on the tester and in real time) will be published later. Значительно расширен диапазон градаций скоростей движений. Кроме анализа скоростей, теперь анализируются и объемы, что значительно повысило точность предсказания. Глубина памяти автомата расширена до 1000. Кардинально изменена система расчета ставки очередного ордера (LotMult более не нужен). Изменена система фиксации прибыли (добавлено траление прибыльных позиций). Убран контроль размера спреда (теперь это делается автоматически).